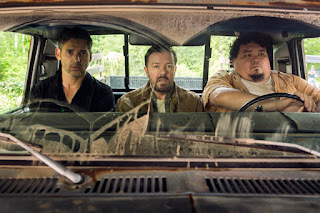 I was interested in "Special Correspondents" for a couple reasons. First, Netflix has been on a roll for as long as I can remember, original content-wise. Their television shows have been across-the-board intriguing, even if some of them ("Hemlock Grove" in particular) didn't fully work. So far, their movies have been good too, by and large. Second, I have been a fan of Ricky Gervase for awhile, and I was interested to see him write and direct a movie. I actually don't know off the top of my head if this is his first writing and directing job. All I knew is that his name is enough for me to spark an interest in something. On the other side, I think Gervase has keen eye for directing overall. Although, I think his flair for writing needs to be improved. "Special Correspondents" feels like the first movie of a up-and-coming writer and director. Its a valiant first effort, but unpolished. Its rough, a little uneven and doesn't go down smooth. Its clear Gervase has a great talent for writing a funny and even a chaotic scene. But his detail for plot mechanics and set-up are strangely pedestrian. Still, I believe just because somebody acts for a certain amount of time doesn't mean they can immediately jump behind a camera, and Gervase does good work here. Eric Bana plays Frank Bonneville, a radio journalist who breaks the rules in order to get a great story. He works closely with his sound technician, Ian Finch (Gervase) whose struggling with his marriage to Eleanor (Vera Farmiga). When Bonneville is given the chance to go to Ecuador to report on the rising political and military tensions of the country, he jumps at the chance. Bonneville invites Ian to the trip, but his problems with Eleanor make him reluctant. Ian ultimately decides to accompany Bonneville and everything is going well, until they get to the airport and find out Ian has thrown away their passports. The two hide in a coffee shop run by Brigida and Domingo (America Ferrera and Raul Castillo). With no other option, the two decide they are going to report on the Ecuador uprising from a spare room in the coffee shop. Ian sets up his sound technology and Bonneville sends fake reports. The story blows up bigger and bigger, and it gets to the point where have to create a fake kidnapping. There are several moments where Gervase finds the humor, even though I must admit that it could have been funnier. I think it could have featured a more stable foundation for a story. I don't know how one could possibly mistake passports and tickets for a note to the misses. But what keeps you watching is the constant chemistry between Gervase and Bana, both of whom do outstanding work here. I also have to give big credit to Ferrera and Castillo who find the quirk and oddball details of their characters and make them work. The biggest surprise of the movie is Vera Farmiga, who knew such a successful dramatic actress could be so funny. There is a moment late in the movie where her character writes a song to raise fundraisers for the "ransom" Bonneville and Ian create, and its preposterously silly, and Farmiga simply nails it. The real problem I have is that I wish there were more moments like that one. I wish the movie had forced me to roll off the couch laughing. I also have to point out that this movie is almost too safe. This was a perfect opportunity to study how we digest media. How media focuses on one specific piece of information, design it to make a reaction, and then pass it off, fact or not. It could have been a comedy about how rumors become facts and how stories get blown out of proportion for propaganda. But Gervase' movie is plays things pretty safe. Maybe that's just my personal hang-up and I should set it aside. But the thing that has always stunk the most is watching a filmmaker drop a big opportunity. The film features a silly reversal in the last fifteen minutes or so, and for a moment I thought I was watching a movie from the 90's. Alas, I think there is enough good stuff to warrant a watch. I think this is an interesting starting point for Gervase. Not excellent, but interesting.